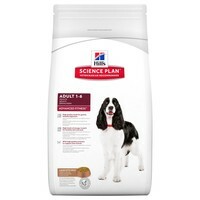 Hills Science Plan Advanced Fitness Medium Adult Dog Food (Lamb) has been formulated to support lean muscle and healthy vital organs. The food contains clinically proven antioxidants, lean proteins and omega 3 fatty acids to provide your medium breed dog with all of its nutritional requirements. Glucosamine & Chondroitin: Help to support and strengthen joints. High Quality Proteins: Support lean muscle. Antioxidants: Help maintain a healthy immune system. (Minimum Lamb 26 %; Minimum Rice 4 %): Ground Maize, Lamb Meal, Soybean Meal, Animal Fat, Maize Gluten Meal, Ground Rice, Digest, Vegetable Oil, Flaxseed, L-Lysine Hydrochloride, Salt, Potassium Chloride, DL-Methionine, Taurine, L-Tryptophan, Vitamins And Trace Elements. Naturally Preserved With Mixed Tocopherols, Citric Acid And Rosemary Extract.